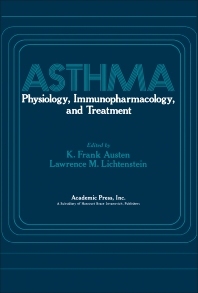 Asthma: Physiology, Immunopharmacology, and Treatment is a collection of essays that discusses the clinical signs and symptoms of allergic bronchial asthma and the effects of a number of intricate sequences of biochemical reactions initiated by the combination of antigen and antibody. It presents such topic as the pathobiologic mechanisms of asthma. The book discusses the physiologic changes in the acute asthmatic attack. It focuses on the autonomic regulation of airway smooth muscle and the nervous regulation of respiration. Another topic of interest is the genetic aspects of asthma. The section that follows is a review of the biochemical, pharmacological, and immunological factors in the release of chemical mediators from human lung. The book also presents the characteristics of pharmacologic receptor systems and the role of parasympathetic nervous system in asthma. The text will provide valuable insights for physicians, scientists, students, and researchers in the field of human anatomy. Does IgG Antibody Induce or Block Reaginic Allergy? Does IgG Antibody Regulate IgE Antibody Production? Does Cyclic GMP Mediate the Effects of Smooth Muscle Stimulants?